Ross Dawson is a highly acclaimed social media futurist and is considered one of the most influential thought leaders in this space. Dawson assists organizations worldwide to prepare for future trends in social media, and he has delivered many a keynote presentation on this topic. Over the last decade, social media tools such as Facebook, Twitter, LinkedIn, blogs and more have transformed how people do business and how they express opinions on their interactions with companies. The future of sales is social, and social media in its various forms will quickly become central to the way salespeople and sales teams work. 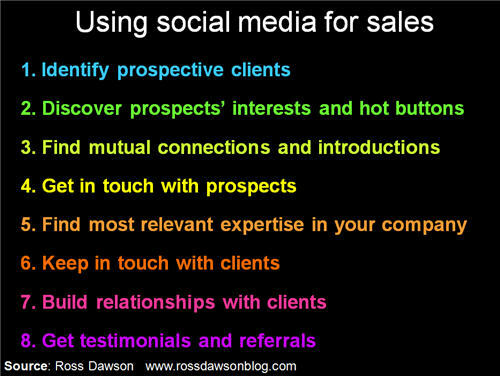 In this presentation, social media futurist Ross Dawson informs sales teams how to best use social media to successfully engage with their clients and prospects. Below are the slides from Dawson’s keynote presentation in a webinar run by ITNews and Oracle on How to Spark Sales Using Social Media Apps. The keynote slides are designed to accompany the speech and are not intended to be useful on their own. However, they have been provided here for illustrative purposes. Given Dawson’s background in high-value client relationships as well as social media, he has developed useful guidelines for sales teams to use social media for building lasting, profitable relationships with their clients. Every presentation by social media futurist and keynote speaker Ross Dawson is designed with the aims of the client and the needs of the audience in mind. A speech by Dawson will bring the latest in the world of social media direct to your audience members, who will take away many fascinating insights from the event. Contact the office of social media futurist Ross Dawson to discuss the precise keynote topic and title that will best meet your requirements.